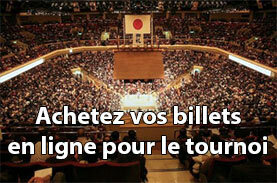 Pour sa troisième victoire, Kisenosato a vaincu Takanoiwa ce mardi au grand tournoi de printemps. 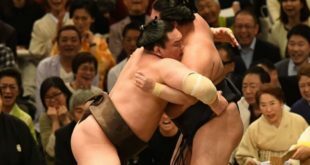 Hakuho et Kakuryu sont également sortis victorieux de leur combat tandis que Harumafuji a de nouveau trébuché. Ce dernier n’a pas réussi à achever proprement son combat et s’est écrasé au sol offrant à Sokokurai son premier kinboshi. Kisenosato a pris quelques coups au début de sa rencontre avec Takanoiwa mais le nouveau yokozuna a su rester calme pour s’emparer de la victoire. Mais le grand choc de la journée est venu dans le match final quand le maegashira 2 Sokokurai a giflé vers le bas Harumafuji. Le chinois en obtenu sa première victoire du championnat. 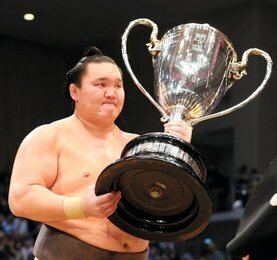 Hakuho, le lutteur le plus récompensé du sumo avec 37 titres remportés, a pris son temps pour vaincre le maegashira 1 Takekaze. 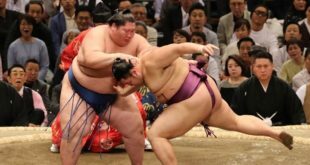 Kakuyu a eu une belle frayeur contre Ikioi mais le yokozuna a gardé son sang froid et a encerclé dans ses bras son adversaire pour le conduire vers l’extérieur du cercle. Le yokozuna Harumafuji a subi sa seconde défaite du tournoi en se précipitant contre Sokokurai. L’ôzeki Goeido a connu sa deuxième défaite consécutive en s’inclinant face au komusubi Shodai. 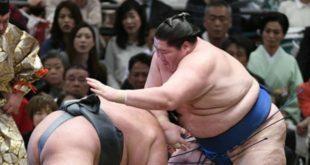 L’ôzeki kadoban Terunofuji continue d’enchainer les victoires en battant le maegashira 3 Shohozan. Le mongol a absolument besoin de huit victoires dans ce tournoi pour éviter d’être rétrogradé. Dans les autres combats clés, Kotoshogiku a donné son maximum mais a finalement dû s’incliner face au sekiwake Takayasu. Kotoshogiku, qui est devenu le premier lutteur japonais en une décennie à remporter un championnat en janvier de l’année dernière, est tombé au troisième rang le plus élevé du sumo comme sekiwake après son score de 5-10 en janvier. 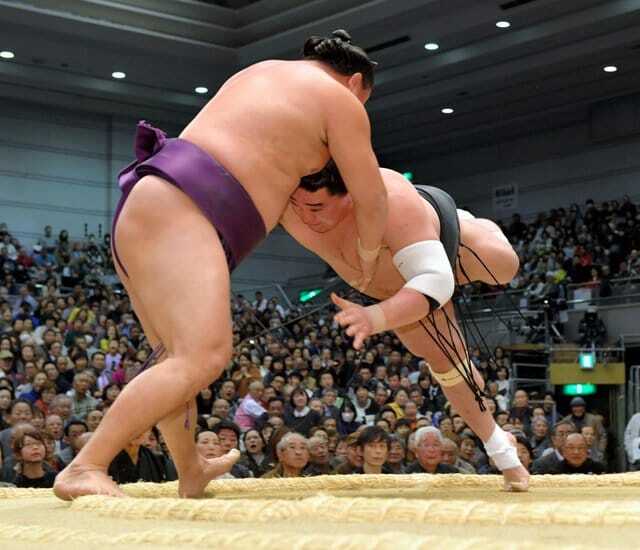 Kisenosato overpowered plucky Takanoiwa to make it three wins out of three on his debut at grand champion at the Spring Grand Sumo Tournament on Tuesday. Hakuho and Kakuryu also emerged victorious in their bouts, but Harumafuji missed the chance to complete a clean sweep for yokozuna, crashing to a shock second loss at the hands of Chinese-born maegashira Sokokurai. Kisenosato was made to work for his victory. He took a couple of thrusts to the neck early on in the day’s penultimate bout at Edion Arena, but in the end had too much gumption for No. 2 maegashira Takanoiwa (0-3) and bumped him over the ridge. The big upset of the day came in the final match-up, when second-ranked Sokokurai slapped down Harumafuji to pick up his first win of the 15-day meet. 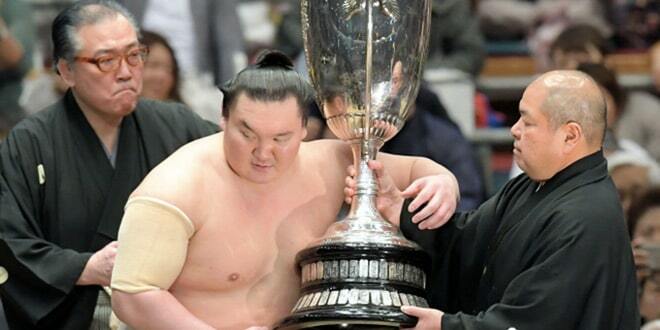 Hakuho, sumo’s most successful wrestler with 37 championship titles, bided his time to muscle out No. 1 maegashira Takekaze (0-3). Kakuryu (3-0) was given an early scare and put on the back foot against Ikioi (0-3), but the yokozuna kept his cool and rallied to get both arms around the top-ranked maegashira and usher him over the bales. On a day of contrasting fortunes for ozeki, Goeido (1-2), who pulled out of the New Year tourney with a right ankle injury, suffered his second consecutive defeat after he lost his way against komusubi Shodai (2-1). But Mongolian behemoth Terunofuji grappled his way past winless No. 3 maegashira Shohozan to preserve his perfect start. Terunofuji is starting as a « kadoban » demotion-threatened ozeki for the fourth time and needs a majority of wins to keep his rank. In another key bout, Kotoshogiku (2-1) looked like he had done enough to dig himself out of a hole against Takayasu (3-0), only to get sent sprawling to a first defeat at the hands of his fellow sekiwake. 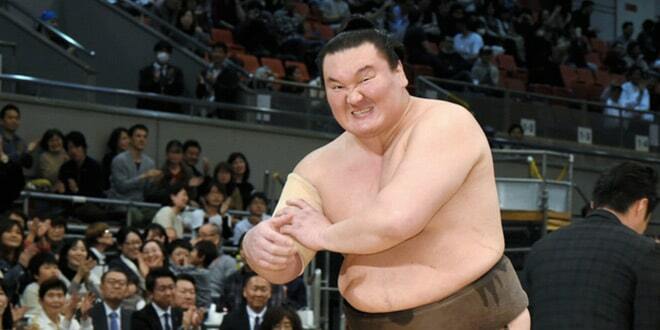 Kotoshogiku, who became the first Japanese wrestler in a decade to win the championship title at last year’s New Year basho, has dropped down to sumo’s third-highest rank of sekwiake after going 5-10 in January. He needs to post at least 10 wins at this tournament to earn a move back up to ozeki for the next tournament in May.